Here are some facts about the Great Barrier Reef. The Great Barrier Reef is the world’s largest coral reef system, covering about 133,000 square miles. It is located in the Coral Sea, just off the coast of Queensland, Australia. 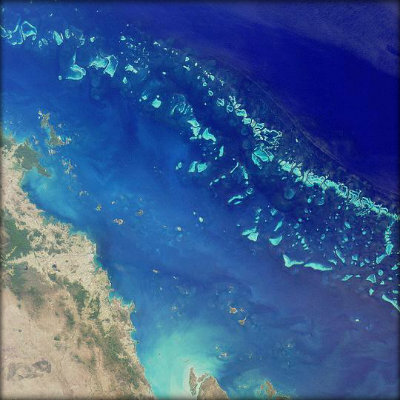 The reef is the largest single structure made from living organisms and is visible from space. In 1981, the 1,600 mile length of reef was declared a World Heritage Site. Almost 3,000 small reefs comprise the reef, as well as about 900 islands. About 2 million people visit the reef each year, and scientists estimate half the coral cover has been lost since 1985. The Great Barrier Reef Marine Park was created in 1975 to protect the delicate reef. The park is about half the size of Texas, or as large as the UK, the Netherlands and Switzerland combined. An estimated 600 varieties of coral comprise the reef. It is also home to over 1,600 species of fish, 150 species of dolphins, whales and sharks, and over 500 species of worm. The reef was formed an estimated 18 million years ago, although much of today’s reef has formed since the last ice age. Taking home a piece of the reef is strictly forbidden. One of the oldest species of fish in the world, the Red Bass, can be found in and around the Great Barrier Reef. The species can live for up to 50 years. There have been over 1,600 known shipwrecks on the reef. In 1791, the HMS Pandora ran aground on the reef, with the loss of 35 men. In 1770, British explorer, Captain Cook, sailed the length of the great barrier reef. He spent over a month repairing his ship after it struck the reef. Many Aborigines have been living on and around the reef for at least 40,000 years. Today, there are resorts and hotels on over 20 of the larger coral islands.